Jensen, a designer from Denmark stocked at Delia Metcalfe, sells an eclectic selection of neutral colours and styles. The greys, blues and browns conjure up a neutral look combined with the black and white designs. Jensen blouses come in a choice of colours and casual styles, semi fitted or loose for a floaty summer feel. These blouses are cotton based fabrics and are a fabulous addition to your weekend wardrobe. One of our unusual cotton mix blouses features an applique design on the front in a unique twist. 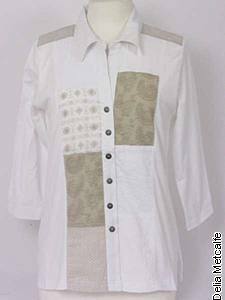 This blouse is white with beige applique design for a cool summer look. The blouse is loose and airy at the back. Another of our blouse designs features a black and white design with a patchwork design featuring a range of black and white patterns. Quirky and cute, this design is a winner for something a little different. Delia Metcalfe also stock a semi fitted Jensen stripy dress made in cool cotton and a jacket to match. Find Jensen pieces at Delia Metcalfe online or follow us on Pinterest!